I trudge down the stairs in fluffy slippers and my brother’s old jumper which envelops me like soft, warm bearskin and then I finally reach my destination. WAIT ONE SECOND. The freezer????? Geeez calm your farm, let me finish the story! *Ahem* sorry, as I was saying, the freezer. A blast of icy cool hits my already red nose until I cannot feel it anymore. But like the great men and women who climb Everest, I carry on in my quest, digging past corpse packets of peas and containers which used to hold food, turned to ice. Finally, I grasp it and pry out my treasure. I take generously, scooping until it gives away to frictional heat and decides to cooperate. And then you find me, sitting in the cold, my toes cushy in my shoes, my body all rugged up, eating a nice big scoop of Rocky Road Ice Cream to make me think of something other than the temperature. It’s so cold, you say you can’t feel your ears yet YOU ARE EATING SOMETHING WHICH COMES OUT OF MINUS DEGREES? WHY?? Is that enough explanation for you? 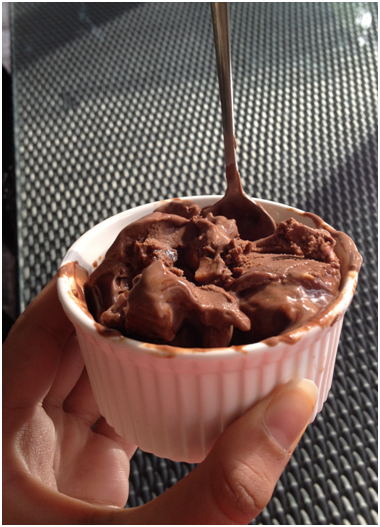 Ironic that a bowl of soup cannot offer me the satisfaction that a Rocky-Road Ice Cream does in winter no? So I know that half of you are experiencing the same steam-out-of-mouth mornings as I am but half of you are sweltering in the ridiculous summer heat. 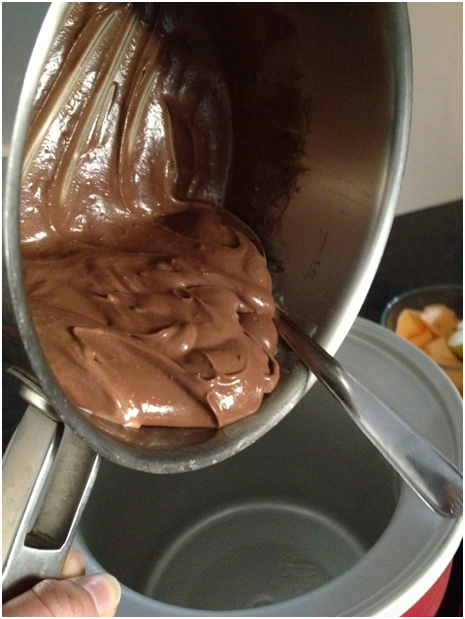 Take off heat, put in chocolate and cocoa powder and gently stir until mixed together and smooth. Set aside. 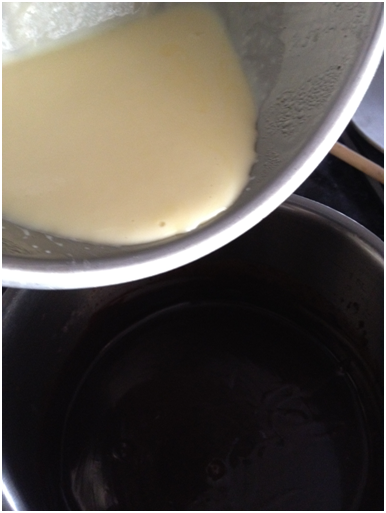 In another large saucepan, add in 3/4 cup cream and milk and combine. Bring to the boil. Turn off heat immediately and remove. 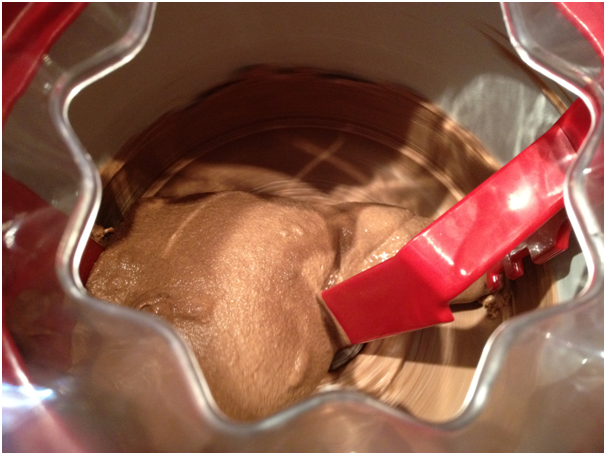 Scoop the chilled mixture into the ice cream machine and churn according to manufacturer’s instructions. Place in a large container. 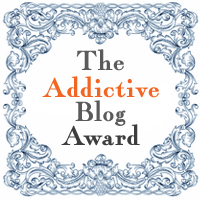 Firstly, I was seriously thrilled to receive another Addictive Blog Award from a great blogging friend and S’mores queen, Kim over at Treats & Trinkets! Thanks so much Kim, you are too nice! I did not want to write anything in my own foodie penpal post until she received the package (which I was so scared she wouldn’t) so here you are a pic of what I sent along to my buddy in the Philippines! Read more about it at her gorgeous blog! Your ice cream has gorgeous texture. I’m puttin’ it on my to-do list for next w/end. Wonder how you can keep your figure – when all this goodies are coming out of your kitchen nearly every second day. Amazing – and it looks so good. *smile I eat ice cream nearly every day. My biggest guilt. Wonderful stuff here and your photos really make everything justice. Loving the chocolate love, bring it on!! yum yum yum! excellent winter ice cream! 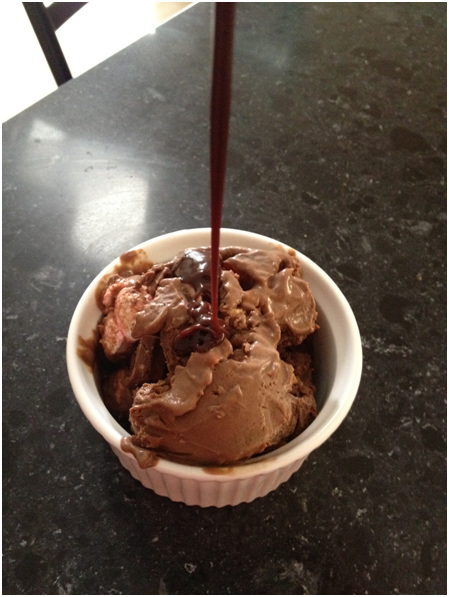 No matter what kind of ice cream I’m eating or making, I am always jealous what others are cooking and having…. 🙂 This looks so good. I’m about to go sleep but I’m having a craving for a bowl of ice cream. Looks so good Uru! Well it is hot here and this look like heaven to me. Totally agree, CCU, that ice cream is perfect for a cold weather day. I’m drooling over the whole recipe, most especially the Turkish bars which I’ve never had. Gotta find them. That’s a bowl of heaven in my book! Love your mix in too! Sending Warm Sunshine your way Uru and thanks for sharing.. This looks amazing! Ice cream is brilliant no matter what the weather! I love the writing in this post, and that sundae looks amazing. Would you believe that Alaska, one of the coldest states in the US, has the highest per capita consumption of ice cream? I don’t blame you one bit for heading right for the freezer. If I had this waiting for me, I would have done the same! Rocky Road was one of my favorite flavors as a kid. Gee, it’s been a while since I’ve enjoyed a big scoop of it. This looks great! Wonderful. Who needs nething other than ice cream anytime. Oh my gosh, your ice cream looks amazing! And Turkish delight…I’ve never heard of that! 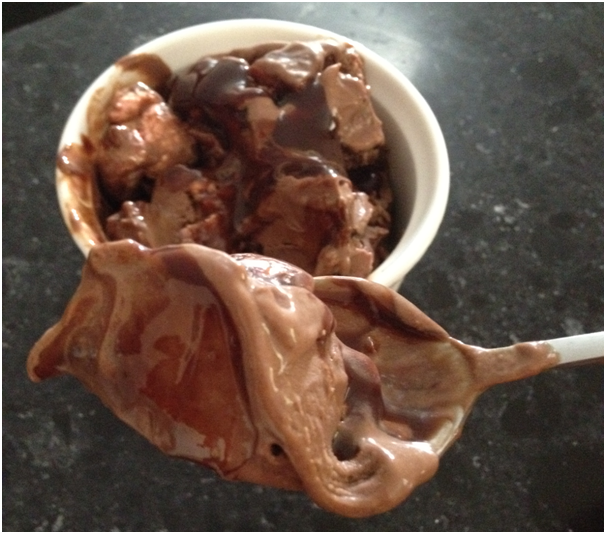 It was winter here when I blogged about my homemade chocolate syrup and used it on sundaes–hey, if it’s good, it’s good. Right now, however, now we’re in the middle of a hot dry summer and the ice cream looks perfect! Who cares about the weather when there’s ice cream in the freezer? Great photos! Can I have a scoop too? Sounds so yummy and looks yum!! haha… so cute, and so poetic! Now, who can resist that ice-cream! Oh my word, this ice cream looks amazing! It’s also quite chilly over here…no sight of summer at all. But ice cream? Well, ANYTIME! Rocky road is definitely one of my top ice cream flavor picks- It’s the marshmallows that sell it for me. 😉 I can just never get enough ice cream, and you’ve got me craving it all over again! Amazing flavors! Would love a big bowl of this! Oh man I would kill to have a scoop or two of five of this right now! Ice cream all year round 🙂 Looks fantastic as always – fabulous!! Whoa Uru!! Loove your ice-cream! looks so delicious especially with all that topping! mmm! 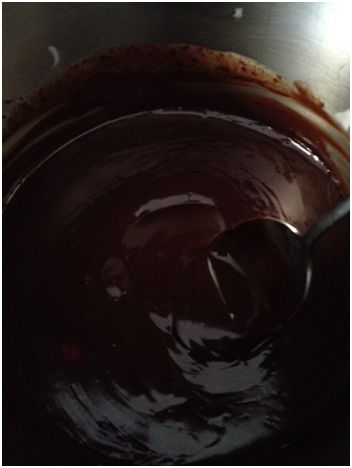 And the ganache! 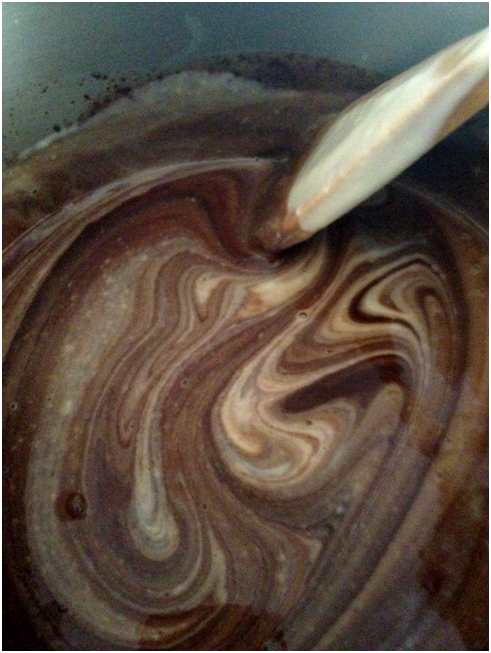 Totally in love with your ganache! Your Rocky Road impressed me so much that I went and made me and my boys some Frozen banana sundae. What beautiful pictures!! You are terrible for my calorie counts and waist line. I so wish I had an ice cream maker. I’m officially jealous. This ice cream looks soooooooo delish!!!! Im getting ready for bed and all I can think of is I scream you scream we all scream for CCU icecream! 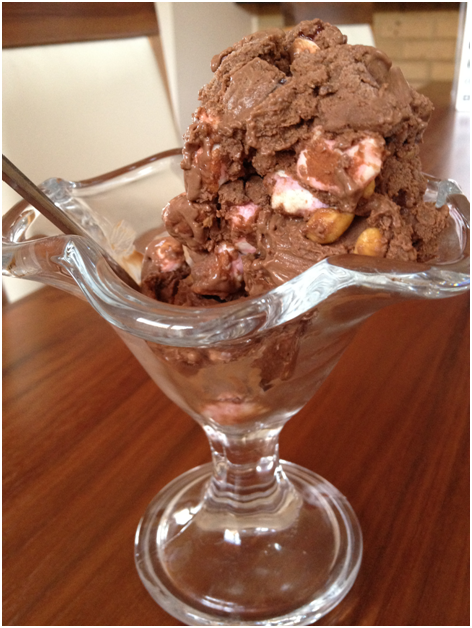 LOVE this rocky road ice cream, Uru. But then again I like lots of ‘stuff’ in my ice cream! Your pictures are fabulous! Especially that one where everything is ‘marbelizing’ I could definitely use a scoop or two or three of this today! Haha omg no problem at all, that ice cream looks fantastic!! 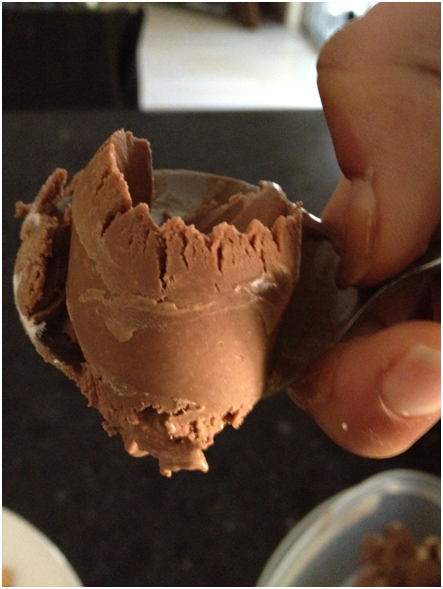 I literally go through a pint of soy ice-cream about every 4 days…. no judging 🙂 Gorgeous pics too, this looks so perfect for summer! First of all I love your writing and although I’m in perfect climate right now I was was reading this snuggled under my covers because it’s chilly here in the morning. 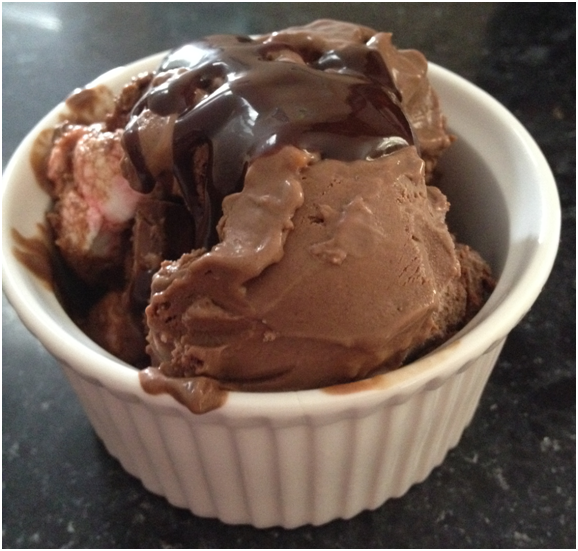 My all time favorite ice cream is Rocky Road, yet I’ve never made it. I don’t have my ice cream maker here with me but the second I get back home I’m making this. Like you, I can eat ice cream regardless of the temperature. Thanks for sharing this recipe. Who can resist to an ice cream like this especially with the temperature at the 40’s? Not me at least! It’s very warm up here – so ice cream is especially tempting right now. But, even in the dearth of winter, ice cream is one of my favorite things. 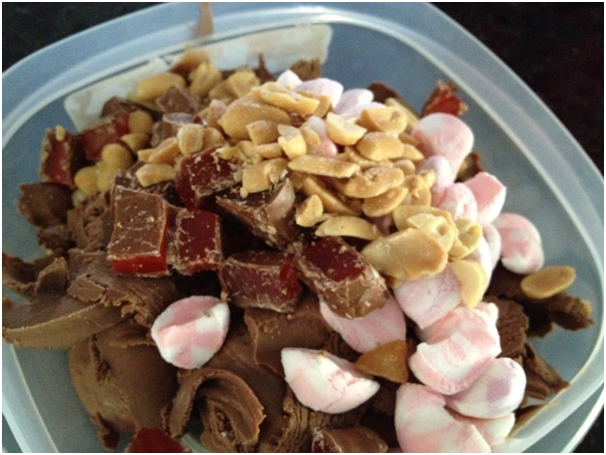 Your rocky road version looks wonderful! Girlfriend, I think you have passed me on number of decadent chocolate posts! Your ice cream looks fantabulous!!!! Rocky Road icecream sounds good to me! And anything containing Turkish Delight is worthy in my books. I totally understand ice cream. Ice cream has no season, it has no time. Ice cream just is and it should be obeyed. At all times. Even rocky road. it makes zero sense, but it just works. our bodies and cravings are baffling at times, aren’t they! i love the things you’ve selected to mix in–very satisfying! Looks delicious and particularly tempting as we’re in the midst of a heat wave here. 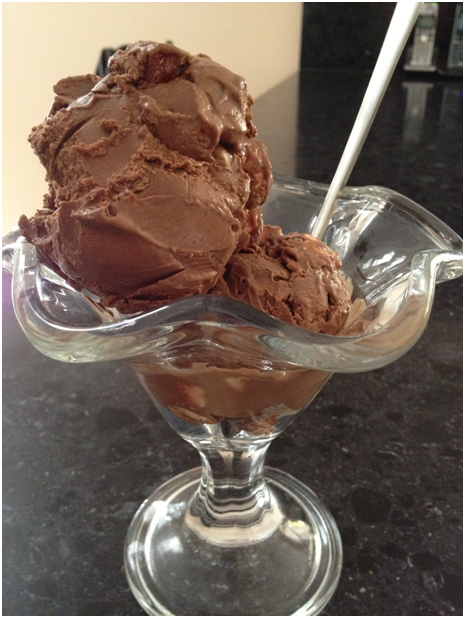 Ice creams… Chocolate… Chocolate ice creams. You can never have enough of it. This looks very decadant… I’m now drooling for ice cream. My hubby just loves turkish delight, so he could devour this right away. Totally agree that ice cream is a great comfort food for all seasons even winter… In fact, it is difficult for me to make ice cream during the hot Melbourne summer because my lousy ice cream maker wouldn’t cope with the intense heat during the warmest weather… Seeing your extra-delicious ice cream, I think I need a better ice cream maker!!! I have soup in the summer so I see nothing wrong with ice cream in winter! Fantastic. I love your mix ins! And I like your ice cream philosophy! I so want ice cream no after readi our post- mouthwatering! Well, I am from the half that is sweltering in ridiculous heat right now, so I am loving your photos of the ice cream! What a very cute and creative post. 🙂 Congratulations on your awards! Thank you so much for sharing them with me! You just made my day! Now all I want is the Turkish Delight ! 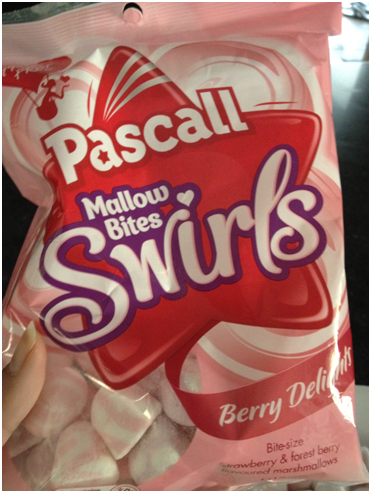 I really miss them, can’t get them here in Singapore…I also miss Sydney winters haha. Delicious post! Well. Now I want chocolate ice cream. You are a girl after my own heart eating ice cream in the winter! Who could resist this delectable treat when you pack in so many goodies!? I am dying to try turkish delight! I always hear how yummy it is. seeing that the temps here are in the upper 80’s, this looks absolutely perfect! The last thing I want when cold is ice cream. In this weather we are having now however it is welcomed and wishing I had a bowl of your lovely treat right now. I used to love Turkish Delight chocolate bars but I really can’t remember when I had one last. Wow, I just discovered your blog. Your photos are gorgeous! I live in the UK (Scotland) where it’s supposed to be summer but I’ve barely seen the sun all year, it’s freezing cold, grey and raining all the time, but yet I’m also eating ice cream too. I’m in total agreement with you, who can resist ice cream and it totally takes your mind off the cold weather, anyway with central heating, who knows what the temperature is outside anyway. Yum! SO MUCH CHOCOLATEY GOODNESS! This looks so good. I would eat liters upon liters of this ganache gorgeousness. A little strange to crave ice cream in the winter, but storage is good, it makes us all a little different. I once made ice cream on the coldest day of winter. I love it year round. 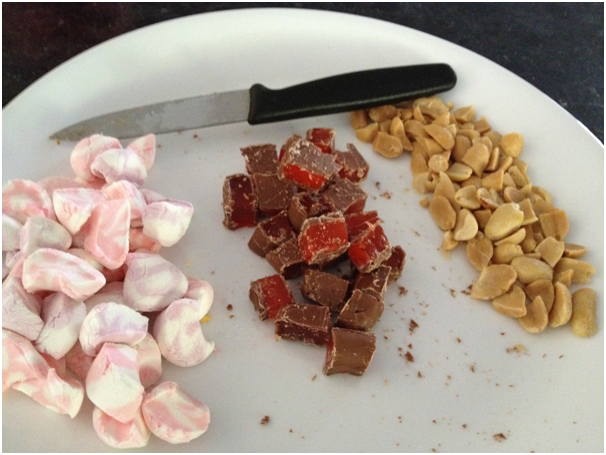 Rocky road sounds delicious in any weather! The opposite season thing so throws me off – because that looks perfect for our sunny warm weather today! It’s been YEARS since I had Rocky Road ice cream, and the worst part? I can think of no good reason why. 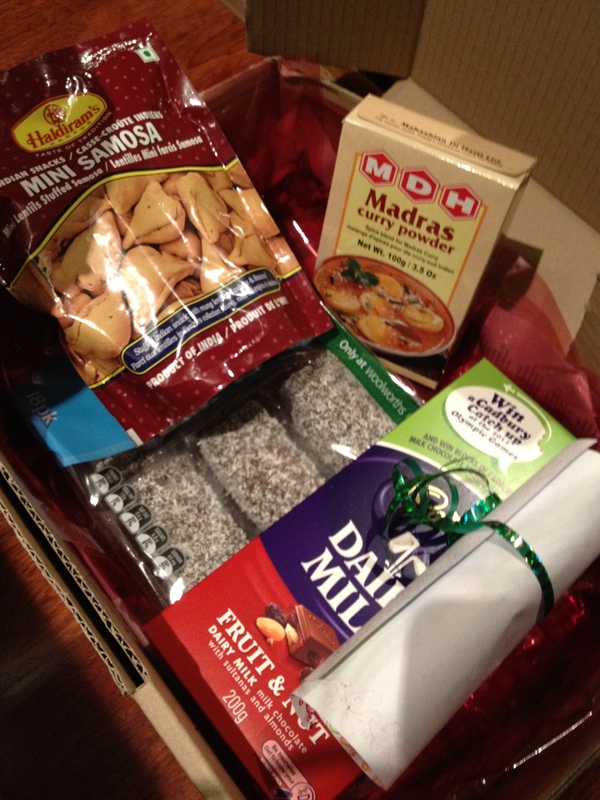 I love your addition of Turkish Delight…inspired! Yum! I totally want a bowl of ice cream right now! We are having heat wave, send us some of that cold weather. I would love a huge bowl of that ice cream right now. I really like that first picture – it took me a good half minute to figure out how you did it! Really interesting picture, great use of reflections. It’s been so hot here I wouldn’t mind trading weather with you, although just for a few days! It’ll be cold here soon enough. And nice recipe, as always. Good stuff – thanks. Nice ice cream…like the idea of adding Turkish delights in it…I sure would love a bowl of this treat. NO NO NO … you can NOT tempt me with turkish delight (love love love) and chocolate and salted peanutes when I have 4 containers of freshly made ice cream in my freezer already. And I just brough home sweet cherries to make ANOTHER batch. You are a truly evil young woman, CCU, and I’m going to stop reading your blog. 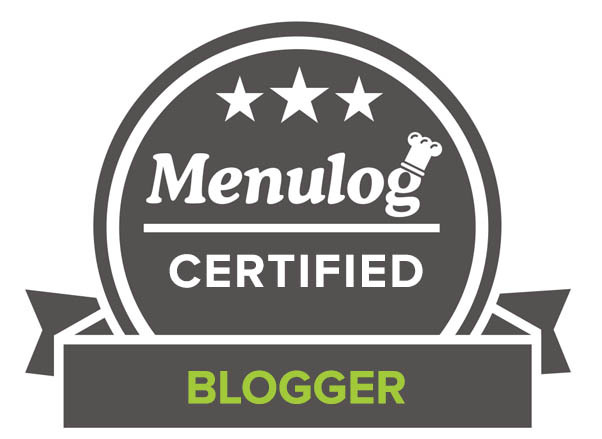 Thx so much for the awards, Uru … You totally light up the blogoshere with your stories & recipes … BTW, loved your two recipes & that you equated your journey with others ascending Everest! Firstly: hasn’t awesomer always been a word? Secondly: Hot & Cold happens to be the only Katy Perry song I like. 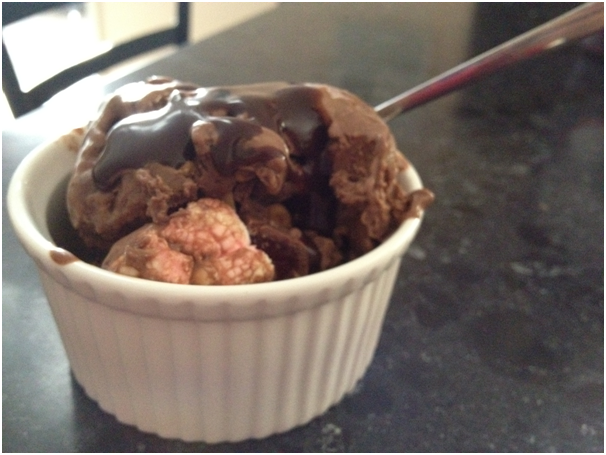 Rocky-Road Ice Cream is my family favorite ice-cream. You did such a great job…and yes it is awesome to have it even in the winter time! :) Great recipe..totally Yummy!!! I eat ice cream when it’s cold, too. Why discriminate? Thank you so much for the lovely awards, my friend. You’re the sweetest! I love eating ice cream all year long. It’s not a seasonal treat. Nope! I love the stuff. Chocolate ganache! Oh my, yum! This is why I’ve deemed you the Chocolate Queen. I’m going to have to use your “Hold your farm” saying. Love it! 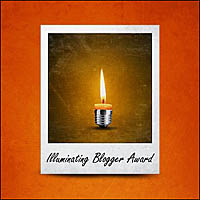 Once again, thank you so much for honoring my blog with these wonderful awards. And you are too kind, I wear my crown proud 😉 – too sweet! More awards – wonderful! Congratulations CCU! How ever do you stay so slim with all of the lovely goodies your make? I love the parcel you sent – full of lovely things. Oh my gosh! Thank you so much for the awards! Yours are much deserved. I found myself enthralled by your writing! Amazing! Wow, I am trilled with this recipe of yours, not only the outcome is fabulous but it sound so easy to be make. Tq for sharing and it makes a big difference to someone like me who makes desserts once a while. 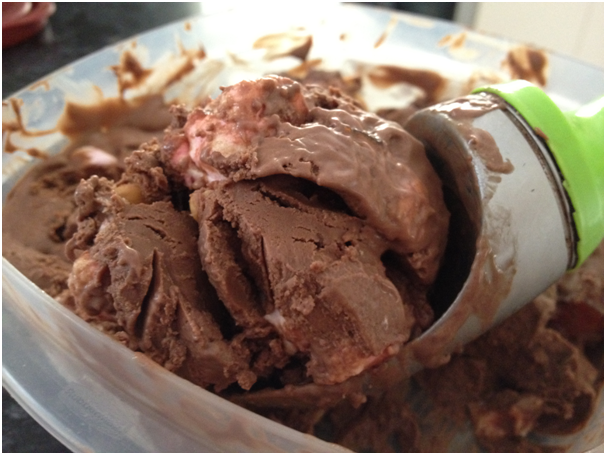 Rocky road icecream! Did I hear you say king sized Turkish delight. I’m in love already. Seriously, salty, chewy and chocolatey. Serious love, right there! Oh boy this looks sooooo yummy! I really really need to buy an ice cream maker pronto.. I couldn’t work out whether you were ill or just chilly, CCU — if you are ill I hope you are better soon. This looks like a worthy variation on Rocky Road. It FINALLY became hot around where I live. So I’d definitely be up for some ice cream. Aww thanks for remembering us on this side of the world- I am literally melting over here! Looks so yummy and decadent! That looks delicious! I’m going to make some ice cream soon – I hope mine looks 1/2 as good as yours! Thanks for enjoying the ice cream! The ice cream looks rich and luscious! What a fabulous recipe, Uru! This is sinfully delicious looking. This ice cream looks yumm, i too eat ice cream in cold winter days.. It taste even yum when u eat it outside in chilly winds..
Is it that cold? I can totally understand your craving for ice cream. When it is cold outside and the heat is on in the house season or temperature doesn’t really matter. Deliciousness outweighs everything. am I right? What gorgeous photos. I’m reading this at 6.47am…and now want ice cream!